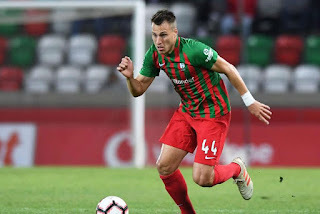 Reports over the past 24 hours have pitted Rangers against English giants Aston Villa, Chelsea, Wolves and Serie A greats Lazio in a five-way battle over Maritimo’s Croat defensive mid Josip Vukovic. The 26-year old, who’s never been capped for his nation at senior level, is said to be interesting Steven Gerrard along with his four rivals and given his underwhelming career we’d have to wonder why. Never having scored a senior goal, the former Croat youth international has similarly only managed 126 appearances in eight seasons of senior football, which has to be classed as a tad concerning, along with a single career assist too. Sure, defensive midfielders shouldn’t really be measured on goals and assists, but even Jason Holt did better for us there and he ended up at Fleetwood. And Vukovic is hardly an 18-year old still breaking through in the game. Vukovic’s market value, at age 26 as mentioned, is barely 500K even if some of the press have him at £1M-£4M+, and this is a link we can’t understand nor the interest from three other significant parties. We have better than this lad already in our youths and we really should know better than signing bottom and midtable players from Portugual’s top flight. Which kind of goes for Croatia’s Premier League too. Sure hope there’s nothing in this one. And we’re absolutely lost as to why Chelsea would want him. An agent stirring up interest to create a little payday for himself and his client, perhaps? Wouldn’t be the first time. Hope we lose this race , we don`t need another defensive midfielder and his lack of appearances suggests injury problems .We would be as well just keeping Jordan Rossiter .